Nothing is more attractive than a sparkling white smile, but unfortunately, many people develop noticeable stains and discolorations that make them feel constantly feel self-conscious. That’s where Glow Family Dental can help. We can offer a selection of professional-strength whitening treatments that are effective, affordable, and proven to deliver dramatic results. 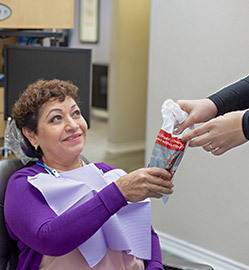 Whether you choose to get a quick in-office treatment or use one of our take-home kits, the end result will be the same: a brighter set of teeth you’ll love to show off. Why Choose Glow Family Dental for Teeth Whitening? Many patients who consistently brush and floss their teeth are surprised to see their smile darkening as the years go by. This is because, even with diligent oral hygiene, factors like coffee, wine, tobacco, certain medications, and even natural aging can cause stains to develop. Once this happens, there is very little you can do about it on your own. Most whitening treatments at the store are too weak to deliver noticeable results, and any homemade solutions you’ll find online will likely do more harm than good. As with anything concerning your teeth, when it comes to whitening your smile, the best thing to do is go see your dentist. This treatment is ideal for patients who want to get results as fast as possible-- the entire procedure only takes about an hour or less! We’ll start by cleaning your teeth and then applying a powerful bleaching gel to them. We’ll then expose the gel to a special low-UV light, which slightly heats it up and helps it break up stains even faster. After about 15 minutes, we’ll wipe the gel off, and we’ll repeat this process until you reach your desired level of whiteness (which only takes 2-3 cycles for most patients). Some patients would prefer to whiten their smile more gradually and in the comfort of home, and our kits enable them to do exactly that. 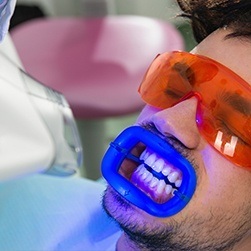 At a quick appointment, we’ll provide you with a set of mouth trays that have been custom-made to fit your teeth as well as a bleaching gel that’s much stronger than anything you’ll find at the store. You can use the kit whenever and wherever you want—while surfing the web, reading a book, or binging your favorite show—and after about two weeks of daily use, you’ll see complete results. You can also use the kit if you ever want a quick touch-up! Of course, after having your teeth whitened, you probably want your results to last for as long as possible! The best thing you can do is practice diligent oral hygiene, consisting of brushing and flossing every day. You should also attend regular checkups here at Glow Family Dental, as we can help remove the substances from your teeth that cause staining. It’s also suggested that you avoid stain-causing foods and drinks such as coffee, wine, tea, and darkly colored sauces and berries. Basically, if it can stain your shirt, it can stain your teeth! Tobacco usage can darken a newly whitened smile as well, so that’s just one more good reason to quit! Following these tips, you can expect your results to last anywhere from about six months to two years. You’ll likely require a touch-up from time to time, which we can provide for you right here in our dental office.